It’s a Sega It’s a Nintendo! It’s… Unique! Before the days of the RetroPie project, video game clones were all the rage. Early video game systems were relatively easy to duplicate and, as a result, many third-party consoles that could play official games were fairly common. [19RSN007] was recently handed one of these clones, and he took some pretty great strides to get this device working again. The device in question looks like a Sega Genesis, at least until you look closely. The cartridge slot isn’t quite right and the buttons are also a little bit amiss. 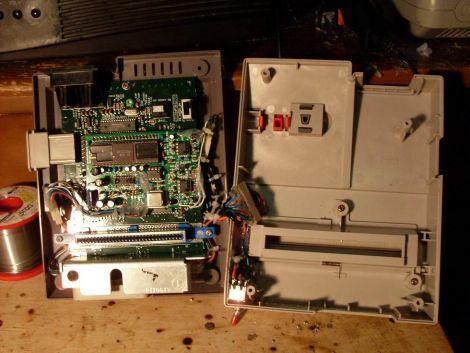 It turns out this is a Famicom (NES) clone that just looks like a Sega… and it’s in a terrible state. After a little bit of cleaning, the device still wasn’t producing any good video, and a closer inspection revealed that the NOAC (NES-on-a-Chip) wasn’t working. Luckily, [19RSN007] had a spare chip and was able to swap it out. The fun didn’t stop there though, as he had to go about reverse-engineering this chip pin-by-pin until he got everything sorted out. His work has paid off though, and now he has a video game system that will thoroughly confuse anyone who happens to glance at it. He’s done a few other clone repairs as well which are worth checking out, and if you need to make your own NES cartridges as well, we’ve got you covered there, too. From [Basami Sentaku] in Japan comes this 8bit harmonica. [Basami] must remember those golden days of playing Famicom (or Nintendo Entertainment System for non-Japanese players). As the systems aged, the contacts would spread. In the case of the NES, this would often mean the infamous blinking red power light. The solution for millions of players was simple. Take the cartridge out, blow on it, say a few incantations, and try again. In retrospect, blowing on the cartridges probably did more harm than good, but it seemed like a good idea at the time. We’d always assumed that the Famicom, being a top loading design, was immune from the issues that plagued the horizontal slot on the NES. Either [Basami] spent some time overseas, or he too took to tooting his own cartridge. Blowing into cartridges has inspired a few crafty souls to stuff real harmonicas into cartridge cases. [Basami] took a more electronic route. A row of 8 microphones picks up the players breath sound. Each microphone is used to trigger a specific note. The katakana in the video shows the traditional Solfège musical scale: do, re, mi, fa, so, la ti, do. A microcontroller monitors the signal from each microphone and determines which one is being triggered. The actual sound is created by a Yamaha YMZ294. The ‘294 is an 18 pin variant of the venerable General Instrument AY-3-8910, a chip long associated with video game music and sound effects. While we’re not convinced that the rendition of Super Mario Bros’ water theme played in the video wasn’t pre-recorded, we are reasonably sure that the hardware is capable of doing everything the video shows.